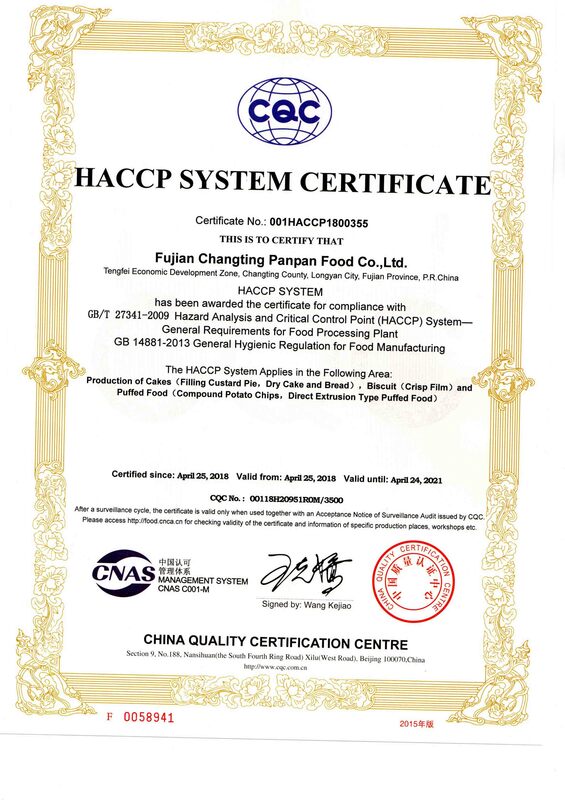 Company Overview - Xiamen Panpan Foods Investment Co., Ltd.
3YRSXiamen Panpan Foods Investment Co., Ltd.
Xiamen Panpan Foods Investment Co.,Ltd. Is an international trade company. It is one of the subsidiaries of Fujian Panpan Food Group. Our company in good faith the principle of mutual benefit to provide excellent quality, low price products to serve the public. Our major brand is "PANPAN" and offers several kinds of products, such as: potato chips, puffed foods, American dry cakes, and other delicious s snacks.Over the years, the company has been implicated in development of industry and technological innovation. Since the beginning, the key-words addressed to the customers are "green, healthy, nutritious, fashion, convenience and reliable products'' Along with it, the company has been continuously implementing automatic production lines from the most advanced countries in this field, like Germany and other highly advanced areas in Europe,in order to establish a standardized production workshop.Our factory passed following international certification:BRC,HACCP,HALAL,ICS,ISO9001,ISO14001.Besides, PANPAN food owns twenty manufacturing companies, and holds marketing networks all over China. As a result, the brand enjoys fast, convenient production and efficient marketing services. Its market shares and reputation among the food companies are already famous and keeps growing.Taking the development concept of "green, natural, scientific and technology research for development", the company was awarded "China's famous food brand reputation", and "China well-known trademark". The company was a senior sponsor for "the BRICS meeting in Xiamen last year and is among "the top 500 Asian brands", "consumer favorite food brand" and won many other awards.